It's no secret I love to throw a party and when I do, I use a few simple tricks to bring that extra wow factor. I'm talking super easy things that take your party up a notch without having to plan ahead or better yet, spend tons of extra money. 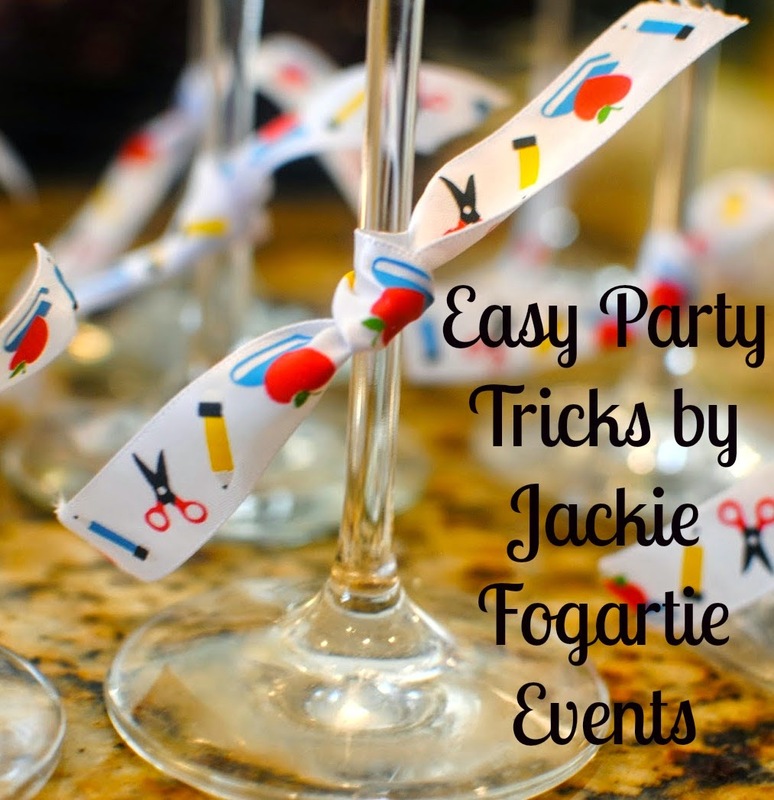 I've got loads of party tips, but for now I'm going to give you three party tricks that will make your life easier and make people think you are the hostess with the mostess. Plus, since you'll have all this extra time, you can sit back with a glass of vino and wait for your party guests to arrive with no stress. Score! 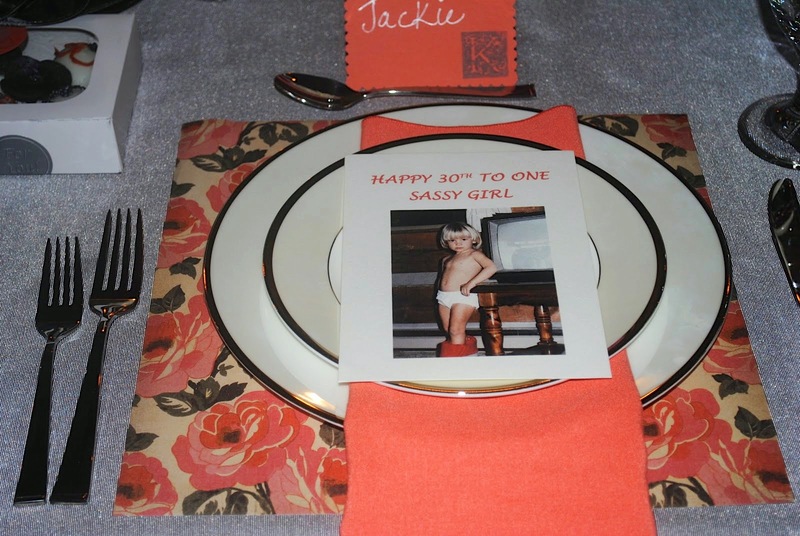 ..and layered place mats using different colors and sized papers here at this strawberry-themed party. 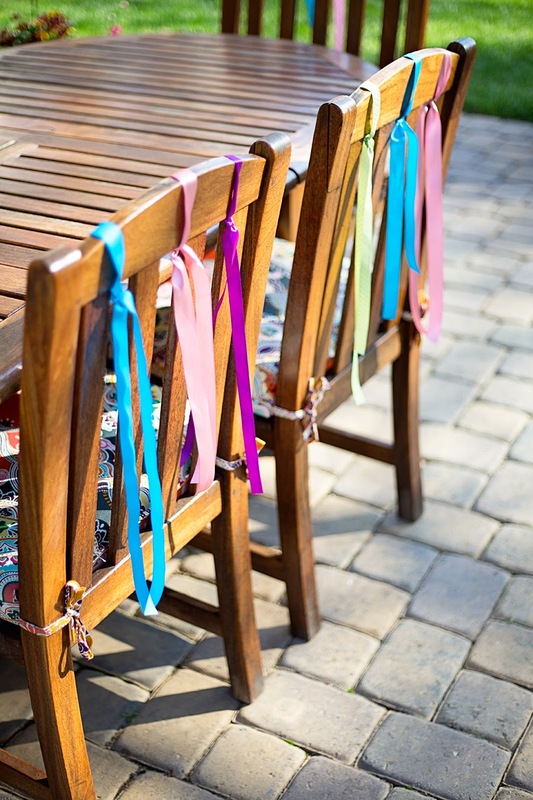 At my recent Aladdin Mason Colllection party I tied ribbon to the backs of chairs which looked great and was super easy to do. Party Tip - don't tie the ribbon to tight or it will be hard to get off and you'll totes break a nail. For a teacher retirement party, I found specialty ribbon that fit the theme and tied napkins/plastic silverware with it. 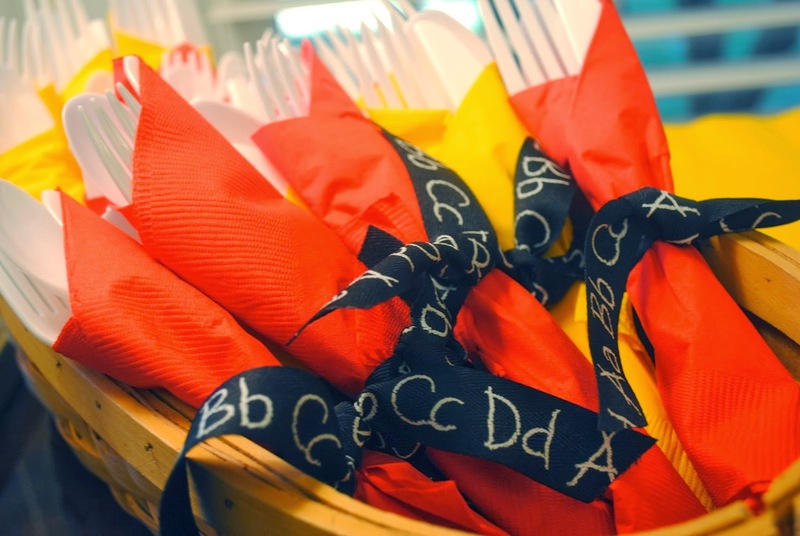 Using ribbon is a great way to dress up paper napkins and silverware. 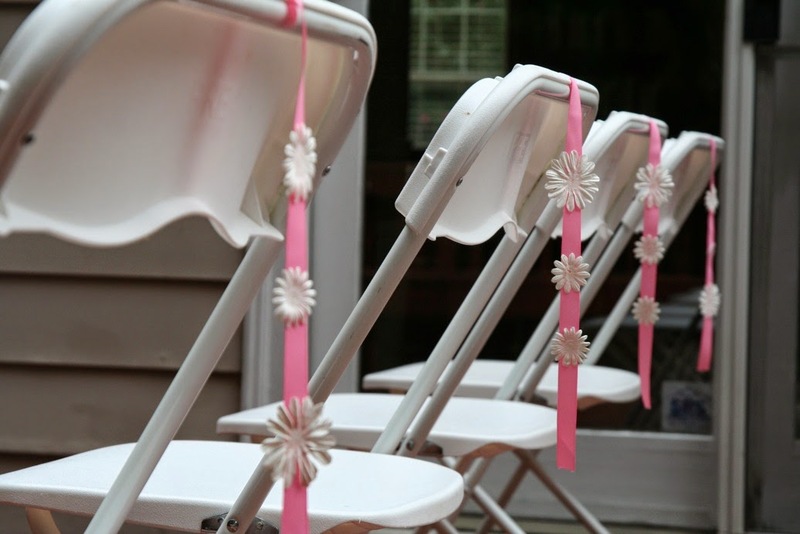 At my nieces baptism party I glued paper flowers onto a single pink ribbon on the back of the chairs for a pretty pink look. No surprise here, everyone loves flowers. But I especially love to use them in unexpected containers - like the beer steins I did for Mr. Fo's birthday awhile back. 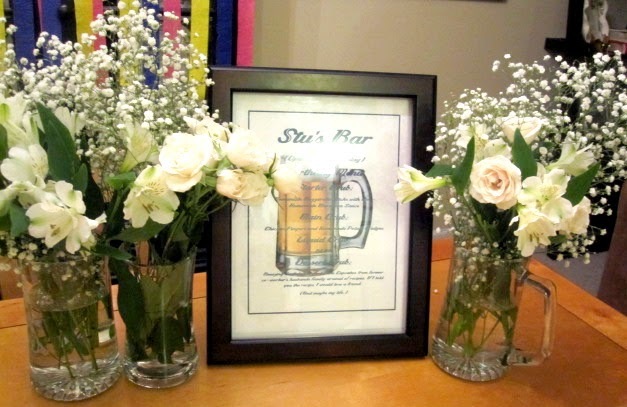 I also like to think outside the box when it comes to floral arrangements. 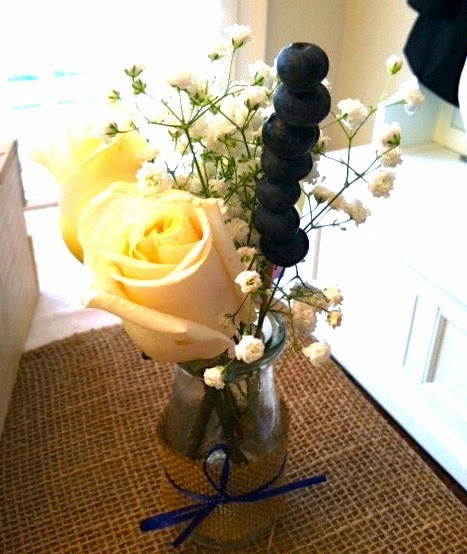 For a blueberry themed baby shower I added real blueberries to floral arrangements to complement the theme. 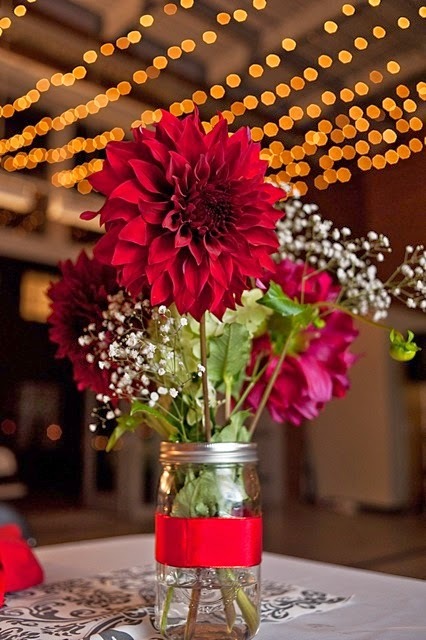 And depending on the occasion, flowers in a mason jar (like here at Trish and Andrew's wedding) can be so very sweet. And notice the ribbon wrapped around the mason jar - that's a combo of two party hacks right there! I hope you enjoyed my little tips and tricks for enhancing your party. If you're interested in making this a regular series, let me know! Love the suggestions...definitely keep 'em coming! Great tips! There are so many uses for scrapbook paper and ribbon for parties! I also like to keep a good stash of spray paint on hand...you never know how a little paint can completely change something. Fabulous ideas for different party celebrations. 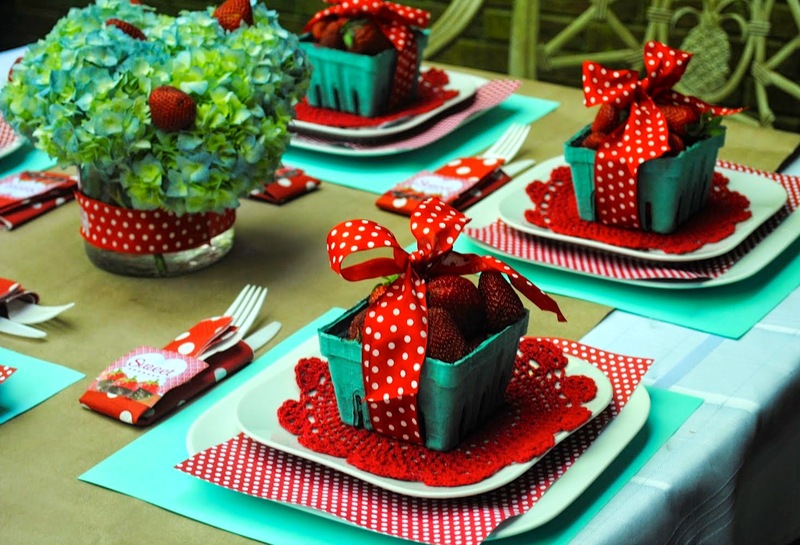 I love the strawberry themed party and beautifully done the usage of flowers.. Thanks for these wonderful suggestions. My company always puts on the fanciest holiday and corporate events! This was by far the best one I have experienced. People talked about getting married here.